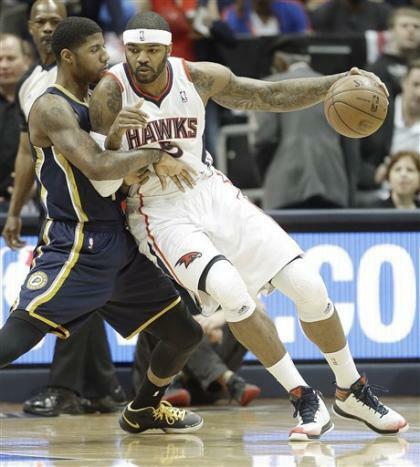 Detroit Pistons general manager Joe Dumars met with Atlanta Hawks forward Josh Smith at 12:01 a.m. ET with a plan to make the free agent forward a substantial four-year offer, league sources told Yahoo! Sports. Atlanta has shown far more interest in working sign-and-trade arrangements for Smith than re-signing him to a long-term deal, league sources said. Along with re-signing point guard Jose Calderon, Smith is the Pistons' top priority on the market, league sources told Y! Sports. The Pistons planned to make a preemptive strike on Smith, understanding that he's a secondary priority for several teams awaiting the resolution of the Dwight Howard derby, sources said. Smith, 27, is one of the free-agent stars on the market, a versatile 6-foot-9 forward that Dumars would add to a front line that includes Greg Monroe and Andre Drummond. Smith averaged 17.5 points, 8.4 rebounds and 4.2 assists for the Hawks last season. Dumars also will meet with forward Andre Iguodala on Monday in Los Angeles, but it's doubtful the Pistons have the willingness to outbid Denver to sign him. Denver GM Tim Connelly and coach Brian Shaw plan to meet with Iguodala in Los Angeles on Monday and present him with a contract extension, league sources told Y! Sports.